Join Pinelands Adventures Naturalist John Volpa for a four-mile hike between the Mullica and Batsto Rivers. Explore the uplands and river edges for native plants and animals while learning about the unique features of the Pine Barrens. Join Pinelands Adventures Naturalist John Volpa for a four-mile hike between the Mullica and Batsto Rivers. 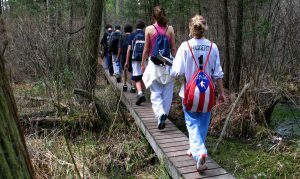 Explore the uplands and river edges for native plants and animals while learning about the unique features of the Pine Barrens. Bring a picnic lunch! 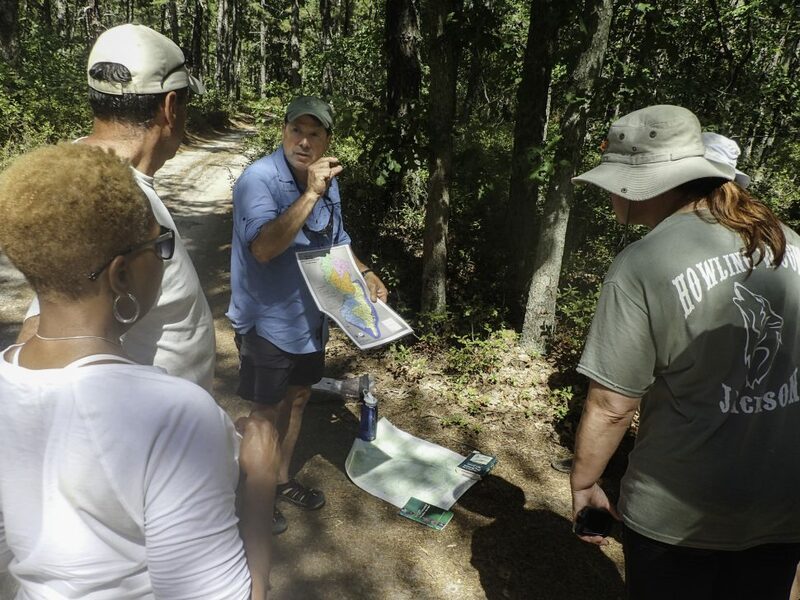 John Volpa, Pinelands Adventures director of education, discusses Pine Barrens ecology during a recent trip. The trip will be led by guide and naturalist John Volpa, Pinelands Adventures’ Education Director. John has a long history of Pine Barrens exploration as a former environmental science teacher with Shamong Township Public Schools and an instructor with Pinelands Preservation Alliance’s summer Teacher’s Institute. An Evesham Township resident, John has also been the catalyst behind the creation of the Black Run Preserve in Evesham. John is a passionate about sharing the Pine Barrens. Pack a a lunch and something to drink. “You are the Best Guide ever—and I have done many guided trips with great leaders. However, you surpass them all. Thank you for a terrific day … I will definitely sign up for more trips.” — Joan R.
“John Volpa was the highlight of the trip. Truly outstanding in every respect.” — Terence G.
Trip departs from Pinelands Adventures on Atsion Road.